In July, AbeBooks will be promoting books from German art book publisher Taschen, as well as First Editions from the 1950s. Both will feature books that are plentiful and affordable, as well as those that are harder to find and more expensive. The features will be promoted by email, prominent placement on the homepage, as well as through social media. Topping April’s top ten signed bestsellers is the winner of the 2013 Pulitzer Prize for fiction, The Orphan Master’s Son by Adam Johnson. Hailed by the Wall Street Journal as, “The single best work of fiction published in 2012,” The Orphan Master’s Son is set in North Korea under Kim Jong Il and tells the story of a man who is both a perpetrator and a victim of crimes committed on behalf of the state. The novel is by turns suspenseful, harrowing, deeply touching, and despite the subject matter – or perhaps because of it - darkly, at times even absurdly, humorous. And love her or despise her, after Margaret Thatcher’s death early last month it’s no surprise that she appears twice in April’s list, for both The Path to Power and The Downing Street Years. A set of first editions of her first three works; the First, Second and Third Series of Poems, published in 1890, 1891 and 1896 respectively. A first US edition from 1922 of one of the first modern picture books for children. Illustrated by William Nicholson with colour pictorial endpapers and seven richly coloured full page lithographs. A first edition, first printing of this work which contains a colour illustration on the front cover by Pablo Picasso as well as monochrome photographs, and a frontis of legendary ballet star Serge Lifar also by Picasso. This copy is inscribed on the fly leaf by Lifar "A Madame Baron, grande amie des arts, cordialment , Serge Lifar, Cannes le 3.9.63." Published in 1651 in two volumes, ‘The New Almagest’ became the standard technical reference book for 17th century European astronomers. 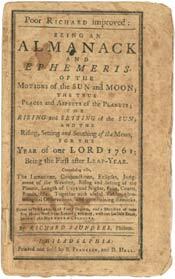 Within the two volumes, there are 10 main sections detailing objects in celestial motion, the Earth and sun’s size, gravity and motion, eclipses, and the structure of the universe. 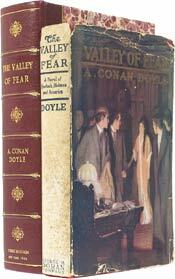 Published in 1915, this first edition is rare in its original publisher’s dust jacket. Illustrated by Arthur I. Keller with seven full page illustrations. A first edition in the red dust jacket, published 1949 and in fine condition. A first edition, without a dust jacket, published in 1925. It also contains a signed envelope, laid in, addressed by Fitzgerald to a friend. The first appearance of The Sign of The Four, the second Sherlock Holmes story by Arthur Conan Doyle, was in this publication. This was Vincent Starrett's copy (Starret was a journalist and author) with his signature and Fridolf Johnson’s Sherlockian bookplate (signed by Johnson). Published 1760, this is a scarce example of Franklin's most famous project, this copy is of added interest for the contemporary manuscript notes added to its margins about burials, marriages, and travel of various Philadelphia merchants of the 1760s. There is also the typical astrological advice and medical counsel including the promotion of the recently-introduced practice of inoculation against smallpox. Published 1818 by Taylor and Hessey, this first edition was bound without advertisements in full crushed red morocco by Riviere & Son.